Taylor of Old Bond Street Sandalwood Shaving Soap Refill (100g) produces a rich and creamy lather that forms a protective barrier over your skin, allowing you to shave comfortably and closely. The cream allows for smooth razor glide, which helps to prevent redness, irritation and ingrown hairs, whilst moisturising your skin to keep it soft and supple. - L.M. 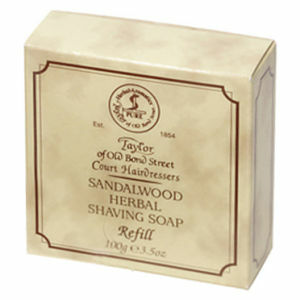 I bought Taylor of Old Bond Street Sandalwood Shaving Soap Refill (100g) hoping to find a good soap that matched the performance of my truefitt and hill soap but less cost, this soap refill fits the bill perfectly. all the reviews place the two at the top of the list with truefitt and hill at number one and taylor of bond street at number two and I have to agree they are very close and work great. It gives me a very close shave with no nicks or razor burn. I use a 34c and feather blades with this soap I have not had to do a third AG shave yet to get a BBS shave. nice thick lather, and it allows me to make two or three passes on the same spot without having to reapply with the brush. The only thing I see different between the two is Taylor of old bond street tends to dry out my skin where truefitt and hill did not. This is a lovely soap for shaving, thick creamy lather well worth paying a little extra for a smooth wet shave leaving your skin smooth with a slight hint of sandalwood. Speedy delivery too.